LINDSAY DESCRIBES HER PROFESSIONAL EXPERIENCE: Over a 38 year career as a speech and language therapist, I’ve worked with clients with a wide range of difficulties; children with speech and language delay and disorders, and adults with swallowing or speech and language impairment arising from a stroke, brain injury or neurological disease such as Multiple Sclerosis, Parkinson’s Disease and Motor Neurone Disease. I’ve also worked extensively with people who have had swallowing, speech and voice problems caused by cancers of the head and neck but my abiding love is working with voice problems which is my specialism. I work with people across the spectrum from children to nonagenarians, with a variety of voice disorders from simple muscle tension dysphonia to complex psychogenic problems. 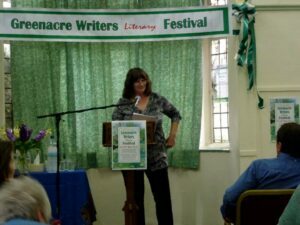 I interviewed author Lindsay Bamfield, a founding member of Greenacre Writers and an organiser of the Finchley Literary Festival. I asked Lindsay what she has learned from her literary experiences and her work as a speech and language therapist. Leslie: Can you describe how speech therapy techniques have helped you and others towards deepened self-expression and self-understanding? Lindsay: In the past I worked with many people who were aphasic, a language disorder usually arising as a result of a stroke. It can affect both comprehension of spoken and written language as well as verbal and written expression. I wrote about the experience of aphasia on my blog: Aphasia does not affect intellect and thought processes are usually unimpaired but the difficulty in translating those thoughts to the outside world is compromised. It was my job to help facilitate that communication. Assessment establishes the individual’s strengths and weaknesses so we use the strengths to work on the weaker areas. I remember Alan with great fondness. He was dysphasic and also dyspraxic (a motor speech disorder.) He knew exactly what he wanted to say but could not physically get the words out. People were always pleasant to Alan but, knowing his difficulties, said very little to him, frequently limiting their comments to ‘how are you?’ and the weather. ‘Bugger weather! It — don’t —, I h—. Nothing! Not imp—.’ Al told me – his facial expression communicating what his words couldn’t. People had forgotten, or never become aware, that he was a highly intelligent, deep-thinking man. His conversations were reduced to phatic communication only. Alan and I used a mixture of writing, drawing, gesture with lots of verbal prompts from me. It might take a whole session for him to tell me simply what he thought about something he had done at the weekend or about his younger days (he was at one time a professional footballer before they made shedloads of cash), but tell me he did. Communication is the bridge from the inside to the outside. Without it, crossing is difficult or impossible and often results in people being overlooked. As an aside, swear words are often retained in aphasia and very useful they are too. I had one patient who communicated quite well with only two words: the sort your mother never wanted you to learn. But he used them with such communicative intonation, you got the picture! When I work with clients with dysphonia – voice problems – I need to ascertain the cause. Dysphonia may arise from a respiratory tract infection or from pushing the voice beyond its limits, but a number of problems arise from deeper issues when people cannot ‘voice’ their thoughts. We often keep thoughts and feelings under wraps, for a number of reasons, often very good ones, but if we constantly feel that we cannot speak out or are not ‘heard’ and taken into account, we are diminished. People with dysphonia may have intact language and are able to write or text, but voice is an important part of the bridge. Without a voice the bridge may not entirely collapse but negotiating it becomes very tricky. So my work here isn’t simply a matter of educating clients on how to look after their voice and how to use exercises to release muscle tension and develop good vocal technique. Although I do this all the time, I must often go much deeper in helping people to understand how their thinking and communication styles affect their relationships at home and work. I use lots of Cognitive Behavioural and Neuro Linguistic Programming techniques to facilitate change. Lindsay reading from her novel in 2013. Has this deepened my own self-expression? Obviously it has shaped my understanding of the value of communication. I think most professionals who work with people when they are very vulnerable, learn a huge amount about personhood. Seeing people deal with the catastrophe of a major stroke or living with a long-term disease or coping with a child who is profoundly disabled, losing patients we have got to know well when they die from their cancer, affects us deeply. In a hospital, we often see the worst of people’s behaviour but we also see the very best. It’s humbling and enables us to appreciate what really matters and see through insincerity and pretension more readily. Leslie: What led you to co-found Greenacre Writers? What are the stand-out moments from your time with group? Lindsay: Four local writers got together to support each other while working on our novels. Two left quite early on leaving Rosie Canning and me to continue. We opened up the group and eventually this grew to four peer-critiquing groups comprising six or seven members each. We were all working on various projects, short stories, novels and memoir. Most of us found that our writing developed a great deal – both from the critiques we received but also from reading and commenting on others’ work. We could learn from others’ mistakes and successes. Inevitably one or two members didn’t like being critiqued and unsurprisingly their work didn’t develop, but most found it a very positive experience. I can’t really pick out particular stand-out moments but the group led to other ventures. Rosie and I also ran writing workshops – mostly for those new to creative writing. We held several writing competitions and published three anthologies. From there our endeavours led us to holding a literary festival. Leslie: You organised Finchley Literary Festival. Can you describe the successes of the festival, and what made them possible? What were the greatest difficulties? Lindsay: FLF began as a single afternoon event in 2012 to showcase the work of Greenacre Writers, alongside five invited guests. Owing to its success we expanded it over the next four years. We were very fortunate that most of the authors we invited accepted our offer to appear, enabling us to host some extremely interesting and inspiring author events. To make the festival larger we also hosted workshops, associated talks and walks. The main problem, though, is the massive amount of organisation, which was mostly carried out by just four or five of us headed by Rosie and myself, and the endless quest for funding. To make a festival a success is to pick great authors and speakers. We’re not interested in Big Names – although many of the authors who have appeared at FLF are doing incredibly well and winning literary prizes all over the place. An increasing chore is having to respond to a number of emails from people who want to appear at our festival, but who don’t fit our remit. Our best events have been from authors we chose while the least effective speakers were a couple of those who put themselves forward. Some people are definitely better at self-promotion than actually writing or speaking! Leslie: What have you learned about yourself through any or all of these experiences? 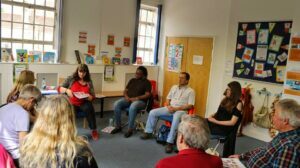 Lindsay running a Voice Skills Workshop for Writers at The Finchley Literary Festival, 2015. Lindsay: Life is an ongoing lesson for those of us who are willing to learn. I grew up being taught to put others first and it was a lesson I have lived by. But the past two or three years have taught me that it is now time to put myself much higher up the list. Sadly, one lesson is that the more you do, more is demanded of you. I’m still working as a Speech and Language Therapist, because that pays the bills, but while the other endeavours have all been interesting, stimulating and often great fun, they have also taken a massive amount of time and effort and much of my decreasing energy. I’ve met many wonderful people and hugely talented writers and learnt a great deal from them but I need to step back. I’m always telling my voice therapy clients that they need to look after themselves in order to look after anyone else and it’s time to take my own advice. My writing has been relegated to the bottom of the league and I need to rectify that, because I’m not sure that I’m a writer any more. Greenacre Writers was set up to mutually help each other with our writing, which it did, but successful ventures never stand still. They tend to grow and with it the need to organize and manage them. I left Greenacre Writers some time back owing to a number of reasons, but continued to work with Rosie on Finchley Literary Festival, but she, too, is busy with other writing adventures so we both need to take back time that the festival has taken. In the end it’s about balance and I’m walking back up the see-saw to get the right balance. An interesting development has just happened but that is strictly under wraps for now! 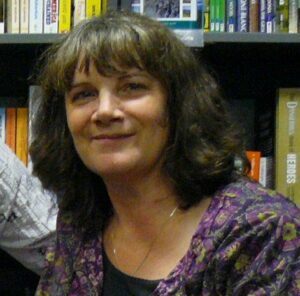 In next week’s interview, celebrated American poet PAM USCHUK talks very openly about her writing, her family history, war and post-traumatic stress disorder.